Fast and easy, Veg Dumplings. If you are like me, then you will always have an abundance of Dosa batter ready at home. But what can you do when you have a new batch and you have still have to finish the old batch. 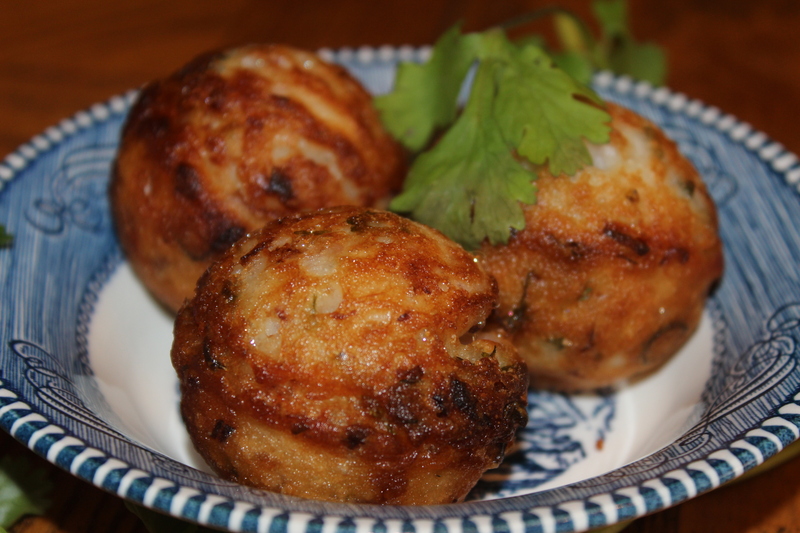 One easy and tongue tested way to finish the batter is to make shallow fried dumplings. These are also called “Kunipaniharam” in Tamil. But in the interest of able to identify with my readers (for whom the above might not be easy to pronounce), I just call these dumplings. These are super easy to make and are a sure hit with my family. Add the Dosa batter, onions, coriander and the green chillies together. You can add extra paprika or red chilli powder for more zest…but I refrain from it. Taste and add more salt if need be. Place your appam pan on the stove and put a couple of spoons of coconut oil in each pit and heat it well. Add enough batter to fill the pit and let it fry for a few minutes. Using the forks, flip over the dumpling and fry on the other side. Be cautious to fry is shallow and long enough to cook inside the dumpling. To test if done, poke it with a wet fork. If the fork doesn’t have any batter at its end, then the dumpling is done. And that’s it. “Kunipaniharam” is done. Its that easy. Serve it hot with Maggi Hot sauce (regular ketchup will do as well), or with pudina chutney.